The Beginner – Advanced days are designated for new or casual adventurer. This is a great option for anyone who is curious about mountain biking or interested in learning basic mountain biking skills or working on developing enhanced biking skills. This tour option would also work great for a ride with a group of friends with a variety of skill levels. We pick you up in a comfortable shuttle from Downtown Seattle or Bellevue around 9am and take you to the trails. 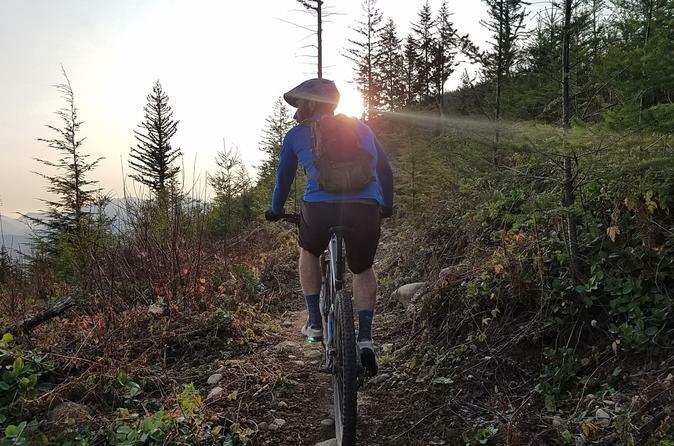 When we are at the trailhead, we will fit you on a top-quality full suspension mountain bike, and provide you with a helmet, gloves and any other protective gear suitable for your safety and comfort on the trail. We will ensure adequate snacks and water are in tow for the day’s adventures and head out. When it’s lunch time, your guide will provide you with an amazing meal either showcasing a local restaurant or a wonderful trail-side picnic – depending on the weather. When the ride is complete, the guide will pack up gear and drive you to your home or hotel. Most tours will have you back to your hotel about 5pm. All Bicycle Adventure tour guides are IMBA ICP trained and are ready to ensure you have the most enjoyable and memorable riding experience. Based on your preference, we are also equipped to observe your riding technique and give practical and repeatable tips to help with your future rides. We are also happy to take off the coach hat and show you the very best trails while making sure your bike is running smooth, your water bottle is filled, and your well-earned lunch is amazing. Additionally, while riding with Seattle MTB Tours, any photos your guide takes will be made available after the tour. Want to have proof of your endeavor? Sign up for the GoPro option while booking and your guide will get footage of you on-trail and email you an edited clip after the tour!